Be the first to share your favorite memory, photo or story of Ryan. This memorial page is dedicated for family, friends and future generations to celebrate the life of their loved one. 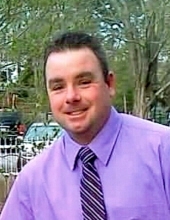 Ryan J. Ferris, 39, passed away unexpectedly Wednesday, March 13, 2019 in Rhode Island Hospital, Providence. Ryan was a resident of Harrisville. Ryan was the loving husband of Danielle R. (Jenness) Ferris, whom he married Sept. 10, 2005. Born in Worcester, MA, he was the son of Kathleen M. (Pepler) and William J. Lafond of North Providence and the late Jeffrey R. Ferris. Ryan worked in the maintenance division of Wright's Farm Restaurant, Nasonville. Ryan was a dedicated member of the Harrisville Fire Department for 17 years. He became a Jr. Firefighter in "95", was a Corpsman with the Burrillville Ambulance and Rescue Association, was a delegate to the Northern RI Firefighters League, President of the Harrisville Hose Co. in 2014, Vice President in 2015 and has been promoted posthumously to Communications Lieutenant. Besides his wife and parents, Ryan is survived by his two young daughters: Mia R. and Paisley G. Ferris, both of which live at home; and sisters: Julie Parlee of North Providence and Michelle Kelley of Walpole, MA. A Funeral Mass will be held Thursday, March 21, 2019 at 10 AM in Our Lady of Good Help Church, 1063 Victory Hwy, Mapleville. Calling hours will be Wednesday from 4 to 8 PM in the Boucher Funeral Home, 272 Sayles Ave., Pascoag. In lieu of flowers, donations may be made to Harrisville Fire Dept. to benefit his two daughters, which can be sent to 201 Callahan School St., Harrisville, RI 02830. To send flowers or a remembrance gift to the family of Ryan J. Ferris, please visit our Tribute Store. "Email Address" would like to share the life celebration of Ryan J. Ferris. Click on the "link" to go to share a favorite memory or leave a condolence message for the family.